Citichic Hotel Sukhumvit by Compass Hospitality is centrally located and is just meters away from Sukhumvit Soi 11, home to some of the area’s best bars, restaurants and nighttime destinations. The hotel is situated within a short walking distance to Nana BTS Skytrain station, Asoke BTS Skytrain station and the Sukhumvit MRT (underground) station. 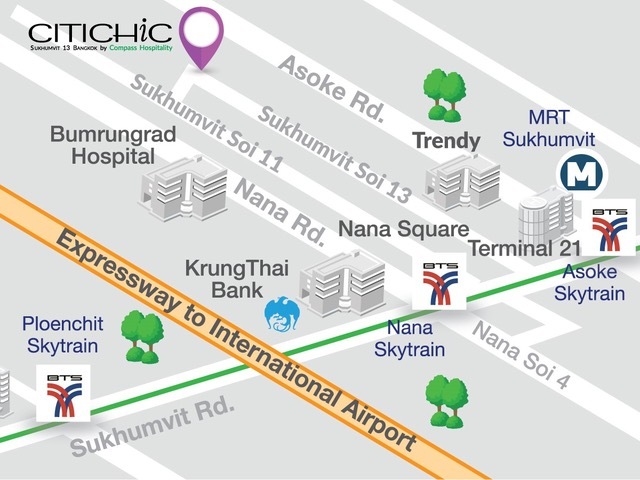 For Shoppaholics, Citichic Hotel Sukhumvit is nearby to several Bangkok’s prominent shopping centers such as Terminal21, Central Embassy, Emporium and many more. Citichic Hotel Sukhumvit by Compass Hospitality. 34 Sukhumvit Soi 13, Klongtoey Nua, Wattana, Bangkok 10110, Thailand.